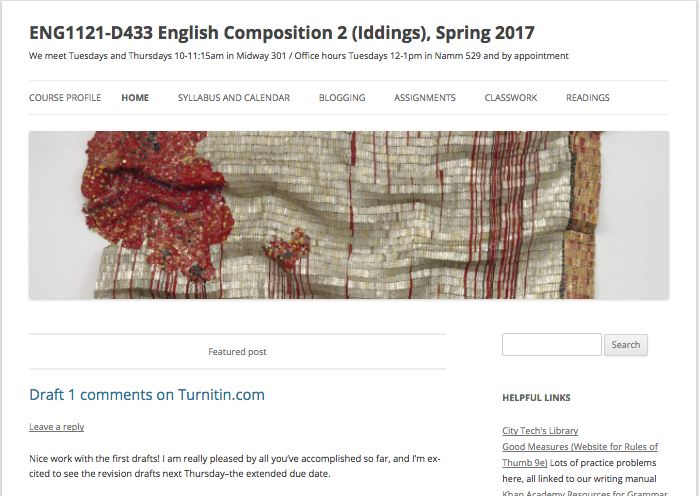 At 15 points of their overall grade, Blogging is an important component of this english course. 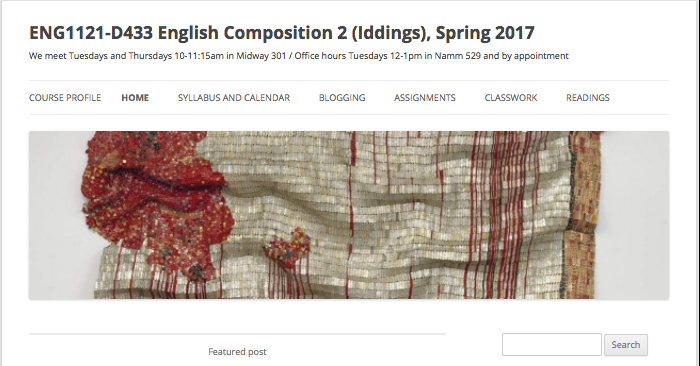 For Professor Iddings, blogging is a part of the larger motto of the class: “Writing—and writing frequently, with intention, and with significant feedback—is a great way to improve your understanding of the texts we will read.” With this in mind, Professor Iddings gives extensive details on how to approach the assignment including the requirements and deadlines, notes on how to post and what should be included, and a grading rubric. In addition, she gives an overview of what blogging is and how its style and etiquette compare and contrast with other forms of class writing. This last component seems particularly important given the likelihood that many students haven’t had the opportunity to blog before. A second feature I’d like to highlight is her main menu item entitled ‘Classwork’. As her page description states, “This is where all kind of handouts, slide shows, and student-generated work will land.” While the page contains only slide shows at the moment, I think it’s worthwhile to note the facility of having a place where any loose-leaf handouts can be stored digitally. Undoubtedly, there will be a student or two (or 10!) who will lose track of handouts that will prove useful to them throughout the course. By uploading them here, Professor Iddings never has to worry about students in her losing access to these documents. The last feature I will highlight here – though there are many more and I encourage you to check out the site! 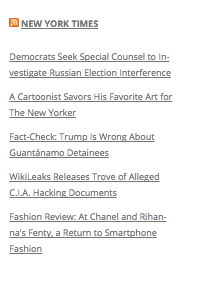 – is the “Helpful Links” section and RSS Feed for the NYTimes which she has in her widget area (the menu on the right side of the course site). 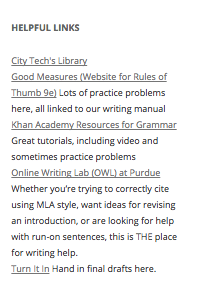 While each of these offers different content – the first providing students with easy access to educational resources around City Tech and beyond, and the second linking to the latest articles from the Times – both work to connect the student’s classroom experience to the outside world. This is an important capability of the OpenLab platform that we encourage instructors to take advantage of!